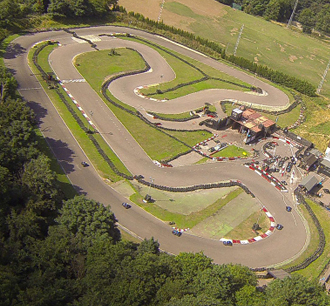 A demanding outdoor kart circuit situated in the Brentwood Leisure Park Complex. This purpose built track has a good mix of corners and fast straights and is suitable for drivers of all ages. The adult 200cc karts are capable of 45mph and the junior 160cc machines are restricted to 30mph. There is an excellent Cafe/Bar available and of course the leisure park also offers a golf driving range, health & beauty spa/gym as well as a dry ski slope, so there are plenty of options if you are looking for a good corporate venue. Leave the M25 at junction 28 and take the A1023 eastbound. Turn right at the VW garage into Mascalls Lane. Follow Mascalls lane into Eagle Way and look for the signs Brentwood Park.